The thing is, building a business around your own ability to get things done isn’t easy either. There will still be fires to fight, never enough resources, challenges that are beyond you, people who don’t always rise when you need them to. Not much difference there. Once you’ve built it, however, the difference between a business that can operate successfully without you and one that operates because of you is literally life-changing. It’s the difference between being set free and shackled. As gratifying as it is to have a business of your own—one that supports your family and delivers products or services that meet your customers’ needs—the day is likely to come, if it hasn’t already, when you just don’t want to work all those hours or feel the burden of responsibility in so many areas of your company anymore. So if building a business is incredibly demanding either way, you might as well spend your time and attention today doing the work and acquiring the know-how that will produce a business that can truly serve your life tomorrow. And that work starts with you. 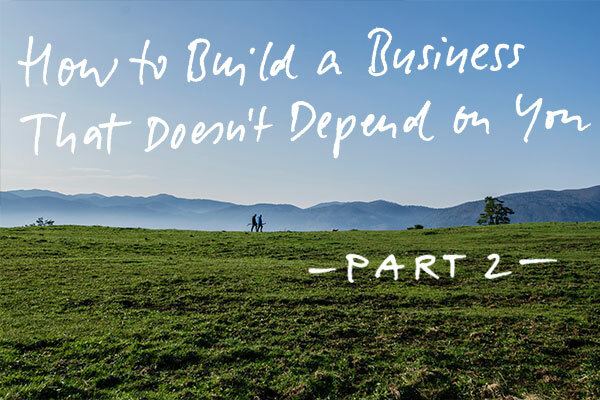 In Part 1 of this series, I asked if you find yourself wishing that your business could operate without you. Is there a voice in your head telling you there has to be a better way? Do you give yourself permission to dream about the day when you can take as much time off as you’d like? A day when meeting the key objectives of your business is not dependent on your personal production, management, or mentoring? Do you listen to that voice? Do you take your dreams to heart? If you want a business that doesn’t depend on you, you have to let your desire build until you have no choice but to make it happen. Creating a self-sustaining business is a personal life choice. It’s the conviction that it’s possible even if you have no idea how to do it. It’s a commitment to discover the way. It’s the recognition that it’s just a series of small, learnable steps—one after the other. If your business is dependent on you today, there are good reasons for it. Most of them have to do with the way that you think about your business. If you think about your business as a place to do the things you do best, and you think about your product as whatever you sell, you’re likely creating a business that works because of you. At EMyth, this is what we call Technician’s thinking. But if you think about your business as a vision to drive towards, and your product as your business process—the network of systems that produces consistent, predictable results—you’re probably on your way to creating a business that works without you. This is what we call Entrepreneurial thinking. Business owners who think entrepreneurially are able to distance themselves from their company enough to create a business process that is separate from them. They understand that their true product is the process they’ve crafted to achieve their customer-centric vision. Most business owners are Technicians at heart and have to make this critical shift in perspective, taking themselves out of the equation when it comes to making, selling, and delivering their product or service. This shift in perspective, when combined with a desire for a company that gives them more freedom, is often enough for a business owner to change their relationship to their business in this fundamental way. No one can sell, treat customers, write copy, estimate jobs, etc. like I can. No one cares about my business like I do. I can’t free myself from my business because my partner will feel let down. My business isn’t in the right place for me to work toward replacing myself. It’s just not possible to have a business that’s growing, supports my family, and gives me the freedom to do other things that I love. [My business/My industry] is unique. I can’t be replaced. If you hold any of these beliefs and you’d like to change the way you think, begin to question the unproductive beliefs that have the greatest hold on you. Ask: “What if that belief is limiting me? What then?” You may discover that your beliefs are just your beliefs, and that there’s an alternative, more entrepreneurial perspective that will bring you closer to the freedom you’re looking for. One effective way to start realizing the dream of a self-sustaining business is to write it down. Create a personal vision statement or life plan about what makes your life most rewarding. Your commitment to creating a successful company that doesn’t depend on you is one aspect of this. What values really matter to me? There’s plenty of evidence that people are much more likely to achieve their goals if they write them down. A frequently quoted study of 267 men and women, conducted by a psychology professor at Dominican University in northern California, found that people who write down their goals and dreams on a regular basis are 42% more likely to achieve them. When you set a goal that’s a significant leap from what you’ve known, it can be especially helpful to talk about it. Talking can help you get used to the goal, feel comfortable with it, and ground yourself in it. Start with whomever it’s easiest to share your big dreams with. That could be your husband or wife, a friend, a partner, an adult child, other family members, or members of your team. Then work your way to the people who are scarier audiences—perhaps because you want their approval or anticipate their disapproval. The more you can speak your dreams to other people, in the face of your fear or embarrassment, the more you’ll get past your discomfort, and the more real your commitment to your own freedom will feel to you. Your business should serve your life. If it doesn’t, then it’s most likely consuming your life instead. It doesn’t matter whether you love going to work every day and just want the option to take a three-day weekend twice a month, or if you want to completely replace yourself in every role you’re currently holding—the specifics are up to you. What matters is that your vision for your business aligns with your vision for your life, and that you’re taking the necessary steps to transform the business you have into one that serves your life. For example, if you’re the head of an advertising agency that you’ve built around your own ability to attract and keep clients and you’re at a place where you’d like to work with just a few of them, you might want to reimagine your Sales and Delivery Systems (and maybe even redefine your target customer) so that your team can successfully replace your production. If you own a contracting firm where you’re the CEO, estimator, and star salesperson but all you really want is to do sales, perhaps the answer is to create a systems-oriented, values-based, customer-centric business that can attract a talented leader looking to run a company just like yours. What’s the business strategy, structure, and result that will meet your needs for your life? For you to safely leave your business for any period of time, you have to be able to trust that every member of your team will behave with each other and with everyone outside your company—your customers, prospects, vendors, strategic partners, and bankers—in the way you’d like them to. Building that trust with your team starts with you designing a culture where people are committed to your vision and embody your values. Your company is a world of your own. Your values are its standards of behavior. But you have to make them known in order to make them work for you. Clarifying your values, expressing them through your leadership, enforcing them through your mentoring, and prioritizing them in your hiring (and firing) all contribute to a culture that’s solid whether you’re there or not. However your company culture looks, acts, feels, and performs today, you can transform it into a culture that stands for what really matters to you. So that it’s part of the air your people breathe. Whatever you may tell yourself, there are no insurmountable obstacles to creating a self-sustaining business once you make the choice for your life. The nature of your industry, the current condition of your business, or its dependence on you today do not have to keep you from opening to a new relationship to your business and discovering each step to make it happen. Part 3 of this series is about building the systems that transport your values into your company and provide for your freedom from it. I hope you’ll join me next week.